Bread, Boar, Booze and Broadway???? | The Food Hussy! Bread, Boar, Booze and Broadway???? Look at that guy - doesn't he look like he's having fun??? Oh he was - he just hates to admit it! I have to admit - I'm hard pressed to put up pics of food after this night! 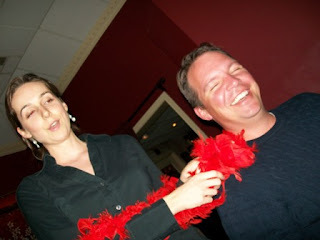 So if you haven't been to Vito's Cafe - which you most likely haven't - it's an interesting and entertaining evening! The restaurant is located in Fort Thomas, KY just off the corner of Grand & Highland. It's a really cute little "village" of buildings and Vito's is at the back. It's very old-school Italian - red walls, white table clothes, etc... but they bill themselves as the only restaurant with SINGING SERVERS! Yes - it's like you're stuck in High School Musical 3 - randomly throughout the evening - they break out into song! And it's just not singing - it's musical theatre! The singers are pretty good - the female is more trained operatically while the male is a bit more "musical theatre" - but both are good. Honestly - it's pretty cheesy - but it's also a lot of fun! Just while you're eating for them to come up and break out into Phantom of the Opera - it brings about a giggle! They were very fun too - they came and sang Happy Birthday to Ron and brought him Key Lime Pie with a birthday candle! Then the soprano sang a song from Carmen to all the boys at my table. Thats the picture of Scott at the top...I have equally incriminating photos of Ron & John on my Facebook page! Should I finally talk about the food? Oh fine - jeez! 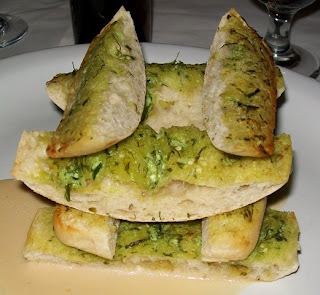 I started with the Gorgonzola Garlic Bread (top food photo). AMAZING! Literally delish! Has a white wine sauce and was so good. The bread was garlicky but yet buttery and flavorful - oh i just can't say enough about it! Next up - our entrees. 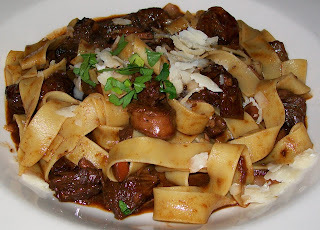 I had the Wild Boar Ragu - which is a reminder of a Palace Dish (Lamb Ragout). It's a strong dark sauce - the Palace serves it with goat cheese and this was lacking that - so I asked for some and Vito brought some for me! Oh it made ALL the difference in the world. 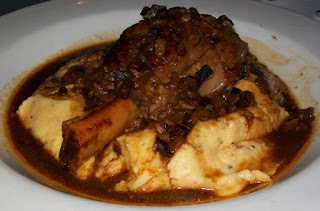 I really love this dish - and the boar instead of lamb was nice. It is missing veggies - mushrooms would be a very nice addition to the dish. My friends had the trout, shrimp and Lamb Stinco (last photo). They were all tasty - I tried each and I'd say the trout was my 2nd favorite. My cohorts also ordered the warm goat cheese salad (delish) and the mushroom croquettes (pretty good). The food is definitely "fine dining" - the dishes are different than you find at a normal Italian place (ala Buca di Beppo, Maggianos, etc...). There are a few pasta dishes but there are a lot of meat/fish dishes. The prices aren't cheap - entrees range from $20-$30...salads are $8-12. So by the time you're done with a drink and a tip - you're easily at $50 per person. And...the singing. In my opinion, it's a bit of a schtick, but you can tell the owner is very passionate about it. Vito even gets up and sings throughout the evening. The patrons were a bit older than our party for the most part and it seems they go for the entertainment. I would say if they want to become more of a regular stop - lower the prices and sing a little less. I mean - just a LITTLE - I know that's part of the charm - but maybe one song at a time rather than three. So for the rating - 3 stars - the food is really enjoyable but the prices are a bit high... For a special occasion, give it a try! First if your going to be a self proclaimed foodie shouldn't you know about food or maybe have worked in the industry? And your bias opinions about Jean Robert's discredits all your work. If your going to review someone you should maybe leave off "It not Jean Robert good but good." Just because you eat at restaurants more than most(that obvious)doe not make you a good food writer, i find your pieces to be bias and boring. The last thing any industry needs is a self proclaimed non experienced anything. I feel sorry for those who try to run restaurrants and people like you walk in the door and post them on some blog, this is the only industry where people like you will tear a restaurant down and everyone will take your opinion on it and probaly not eat there so, do this industry a favor and your self by quit try to be a food critic and just be a diner, oh and one last thing, people like you are the the reason why restaurants mess with food. Well Mr. Restaurant Defendant - it's an opinion and it's my opinion. I happen to like my opinion. I'm not biased towards Jean Robert - I hate Lavomatic and that's his! I like Greenup, Chalk and Pigalls. Don't really like JeanRo Bistro either. And because I have an opinion about food that I pay for - you're saying a restaurant is justified if they want to "mess with my food"???? Maybe they should strive to improve since they are providing me a product that I'm paying for?! to the self proclaimed restaurant defendant: you have strong opinions. 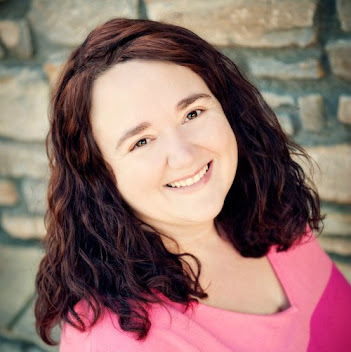 why not write your own blog? 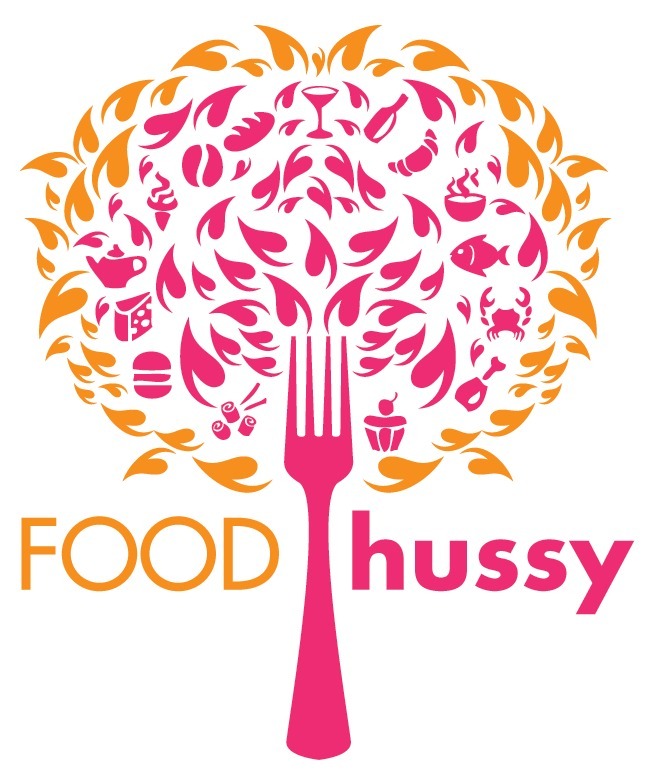 food hussy: i love your blog, keep at it. that dude probably works at the place and is pissy about your criticism. For such an impressive resume it just seems like such a shame to have a grand chef working at an opera restaurant. Perhaps he's looking for a career change into show biz? I hear the food isnt bad though. The gorgonzola cheese bread is to "die for", according to my girlfriend. Maybe I'll come in for my b-day and have the Chef sing "happy b-day" in French for me!! Jason - I agree completely on the gorgonzola bread - it was AWESOME!